At Heirs Holdings, we believe in, and demonstrably practice, Africapitalism as our investment strategy. Our investments across key sectors of the economy including financial services, hospitality & real estate, power, oil and gas, amongst others, reflect our commitment to engage in businesses that generate economic profits while contributing to widespread social prosperity on the African continent. For example, our inclusive approach to banking, first through Standard Trust and now United Bank for Africa (UBA), has allowed millions of people formerly excluded from the formal financial services sector, to now own bank accounts, access capital and execute fund transfers to friends, relatives and business partners all across Africa and around the world. Just as we have done in banking, I look forward to Tenoil – our oil and gas investment arm – to impact the Nigerian energy sector through building a truly indigenous company that is fully integrated across the energy value chain. 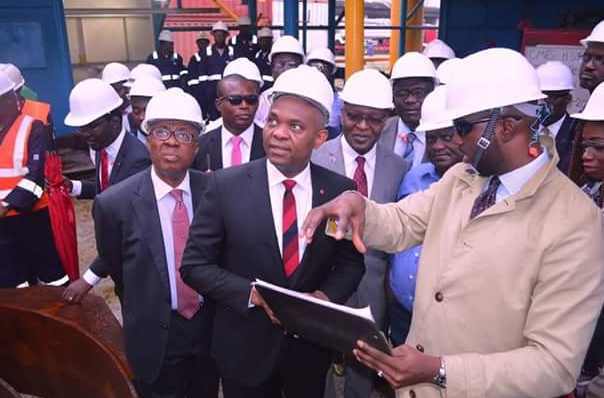 Today, at the Millennium Jetty in Marina, Lagos, I inspected Tenoil’s readiness to sail offshore to commence the last and final lap of our first field development, and I am happy to share the remarkable progress we have accomplished on this journey. After a successful drilling campaign in 2014 that proved commercial quantities of hydrocarbons, we strategized on the best way to commence production from this our first oil and gas asset, with a minimum chance of failure. One option was to employ the services of foreign and proven international companies to ensure that we reached the milestones we wanted to on time. However, we weighed this option against our philosophy of Africapitalism, which endears us, as Africa’s private sector, to make deliberate long term investments that lead to both economic profits and social prosperity in Africa, we chose to invest locally to develop indigenous expertise so that Africa can eventually become self-reliant on her people and their talent. This is the philosophy behind our decision to use Nigerian oil and gas service companies to deliver our first oil and gas project. We made this decision realizing the risks involved in terms of the level of experience and availability of quality materials locally, and as such ensured that in-house at Tenoil, we have sufficient knowhow and experience to mitigate these risks. Our experience so far demonstrates that choosing and supporting a reasonably good local company can still lead to the desired end, while being significantly cheaper. The gains from using a local company are numerous– more accessible workforce, greater cost savings, and an opportunity to invest in the next generation of African professionals. All the engineering design and fabrication of a substantial number of the equipment we intend to deploy offshore, were undertaken by two local companies, JK Orion and Compact Manifold & Energy Services (CMES), working closely together with our in-house teams. We hope that by the end of the year, all the equipment will be fully installed and ready for production to commence. This is not to say that we have not employed any foreign expertise in our operations. Where we had to, we have augmented with foreign service providers to ensure that our equipment is best in class and fabricated to international standard. Some of the units that we intend to deploy were manufactured in the USA. At the end of the day, it is this blended combination of local ability and foreign proficiency that will take our continent to where we need to be.